Nothing catches the attention of the fashion crowd like a child model full of personality walking on the runway. Dress her up in a towering traditional Chinese silver headdress and you have a winner! That was how Chinese designer Han Zhang opened the XY Spring 2019 runway show. 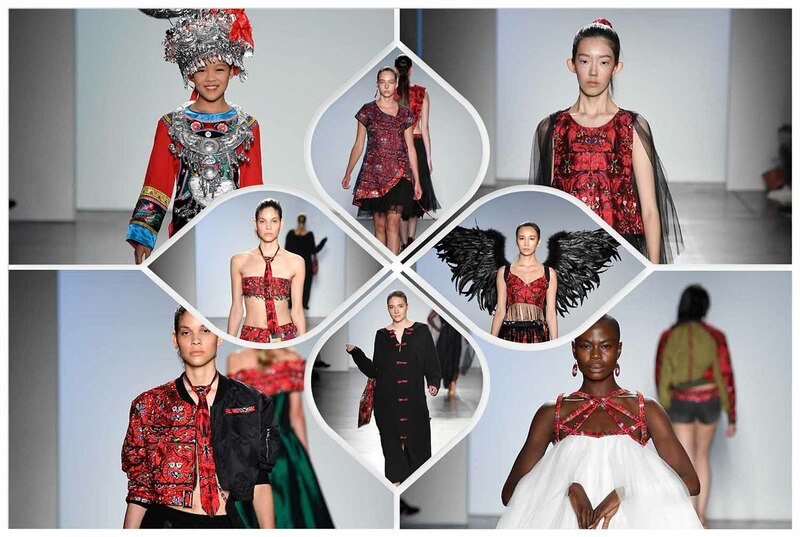 Inspired by ethnic Chinese cultures with a focus on the Miao people, Han fused tradition with modernity using Chinese embroidery and contemporary fashion silhouettes. Using black as the main color palette, red and green were used as accents in the sumptuous silk and textured tulle creations. An emerald colored mid-length silk dress, with fitted waist and princess-line bodice featured a beautiful contrast red off-shoulder design. A dramatic silhouette was created with a model wearing large black angel wings. This may not be the modern Chinese look you are expecting, but these silhouettes easily catch a fashionista’s imagination.